Crush biscuits (in a food processor if you have one) and place the ingredients in order listed into a microwave bowl. Cook in the microwave for 3 minutes, until butter is soft/melted. Mix and press into a lined slice tin. When firm, remove from tin and slice into bite-sized pieces. This can be stored in the freezer, but it usually doesn't get that far in our house!!!!!!! ***WARNING.....stopping at one is near impossible!!!! Now with all that chocolatey excitement, don't forget to sign up below!!!! See you tomorrow night! They sound too dangerously yummy, Wendy. That's what we need for Friday night. If I don't forget! =P I have 3 embroidery projects which need doing. However, I'll probably be on a completely different time frame, being in the eastern US. I guess that makes it Thursday night? LOL The chocolately goodness was kind of you to share. So excited for FNSI. Finishing a baby quilt and working on Jenny's Shabby Rose Block #4. Thanks for the recipes, Wendy. I have my projects piled high! mmm sounds yummy - I'll be there - no idea what I work on...but I'm sure something will come to mind. I'll be making a day of it - last day of leave so I better make the most of it while I can. 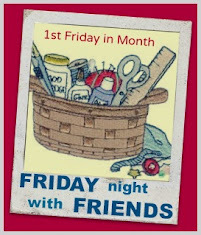 Sorry I can't join you this month - we have friends coming Friday afternoon for the weekend! Yummy and on my dish too LOL..
See you tomorrow night. I have a heap of quilts that need sleeves on for our Hanging in October. with everything on my to do list I best not miss it at all! I am working on my quilt experiment week 5 block as week 6 block is only 2 days away, and my 6 inch blocks swaps. Can't wait!! Hope you are feeling better soon! Looking forward to it! Hopefully I can do some tracing with the lighbox in the day time ready for some stitching at night! I have missed my sewing room so bad lately lol! hubby will be working & I can't wait for FNSI, which is tomarrow whoo hoo! I plan on working on & hopefuly finishing my trip around the world quilt, that reminds me I gotta go buy some batting lol!Happy sewign everybody! Ok, I was able to get some sewing done this morning so perhaps I can make sure that I can get to the machine tomorrow night as well!! FNSI -perfect timing, will be placing it on my 7 pillars blog this time as I plan to work on stuff for the home. Usually FNSI tends to go in my country fragrance blog, so this will be a nice change. The chokkie recipe looks quite tempting!! Oh what to sew, what to sew, so many projects and only one night...thanks Wendy and hope you're feeling better soon. Looking forward to a night on sewing hopeful it doesn't to cold...Wendy hope you are feeling much better soon. Will definitely try the slice Yummo! Totally understand the sore throat /sinus thingy, I've been fighting the same germs for the past couple of weeks. Hope you're all better for a little Friday sewing. Thanks for having us, I'll be casting on more socks. I'm going to have to go and make that yummy slice in preparation for tonight I think! 'See' you all tonight! Oh my! Just as well it's too far to the shops or I'd be busy in the kitchen this arvo. Count me in I'm ready to sew I hope I've done everything right. I have a lot to do! Those chocolates sounds really yummie! The chocolate bars are they dark or milk chocolate (perhaps the word is dairy)? Would love to make them for tonight! I'm excited to participate!! "See" you all tonight! Looking to a great evening of relaxation and sewing! It has been a long week at work!